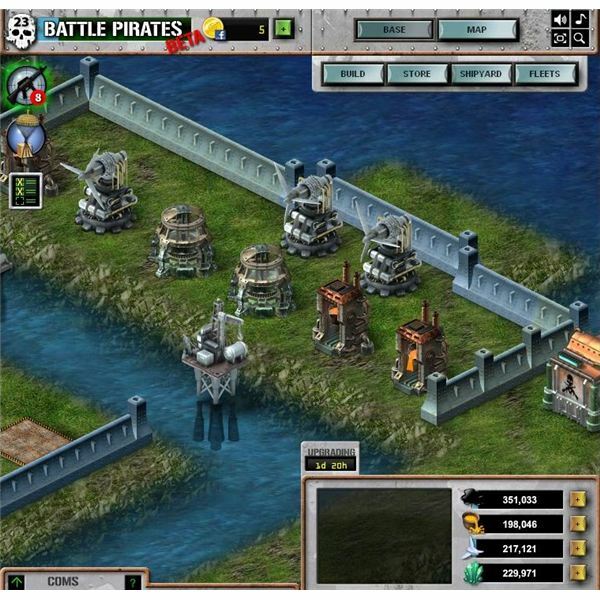 There are four types of resources in Battle Pirates: oil, energy (wind), metal, and zynthium. These are used to make new buildings, upgrade existing buildings, do research in two labs, make, repair, or refit ships, and make defensive walls. You can make oil rigs, wind turbines, metal foundries, and zynthium refineries in your base to get a small trickle of resources on a lengthy timer. Unlike most other Facebook MMORTS games, however, the resource collectors in your own base won't give you enough resources to play very fast at all. So where do you really get resources in Battle Pirates? A salvage fleet is a boat filled with roughly equal amounts of all four resources. These spawn on the Battle Pirates map next to active player bases, at a level appropriate to the player. Initially they belong to the Draconians, the computer-controlled pirates in the game, and have a red flag with a black dragon. Salvage fleets that have been captured by another player fly a red flag with a skull, and salvage fleets that you've captured fly a white skull flag. As salvage fleet level goes up, so does the amount of resources it contains, but also how well-defended it is. Salvage fleets are an excellent way to get lots of resources quickly when you need some of everything. On the downside, they appear somewhat randomly and can take some searching to find. You can also watch for salvage fleets while exploring to know what level of active player base must be nearby in the fog, and also whether a particular base has an active player. As a general rule, s/he who put in the work of capturing the salvage should get to keep it. If you're inclined to play well with others, don't steal other people's salvages. (Unless it's been sitting there for several hours.) Otherwise: be aware that just because you don't see any of their fleets in the area at the time, they can still see you steal it. Then there are mines. These are islands of a single resource type in the middle of the ocean, surrounding a Draconian base, ranging in level from 1 to 10. As mine level goes up, so does the speed of mining. Like the salvage fleets, the defending Draconians are more powerful for higher level mines, though not as powerful as the same level of salvage. A level 6 mine has the same guarding fleet as a level 4 salvage. Unlike the salvage fleets, you won't always have to fight to capture a mine. Mines start out with a defending Draconian fleet. The first player fleet to attack it will face the full healthy fleet. If the Draconians win, the second fleet to attack will face a damaged fleet, and so on until the Draconians lose all their ships. The victorious player gets a lump sum of resource for defeating the Draconians and a small bonus to their own resource generators while they own the mine. They can mine from it, defend it without mining, or release it. The Draconians send out fleets regularly (about once per hour) to recapture player-owned mines. If the owner doesn't have a fleet there, the mine returns to the Draconians and the next player to attack it will face a full healthy fleet. If the owner is there but loses, the next player will face a damaged fleet. And finally, if the owner voluntarily releases the mine when they're done mining, the mine will fly a Draconian flag but won't have a defending fleet at all – the Draconians think they already own it and therefore they don't need to send a fleet to fight for it. This makes it much easier for the next prospective miner. The owner can also release the mine while mining if a Draconian fleet heads toward it. 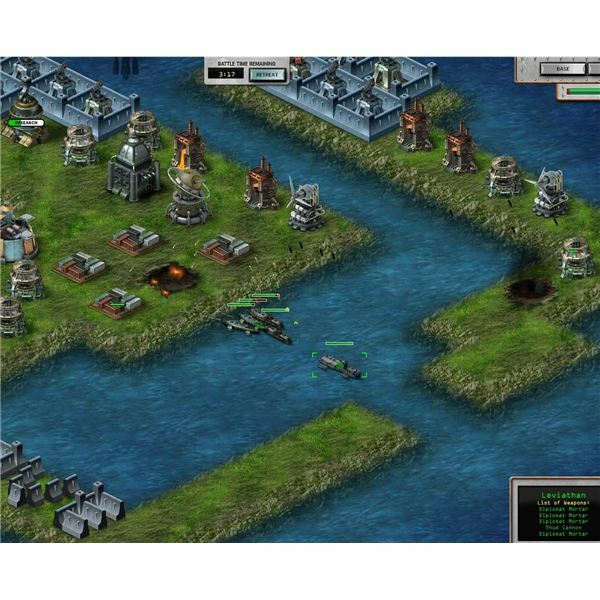 This will cause the fleet to touch the mine, discover their own flag, then turn around and go back to their base. The owner can then recapture and resume mining. First, you can't permanently own a mine even if you could somehow defend it from all other players, which you can't unless you don't plan to do anything else in the game except defend mines. It's not worth the repair bills, really. Eventually the Draconians will wear your fleet(s) down while you sleep, while other players attack your unguarded base. Instead, think of the resource mines more like gas stations. 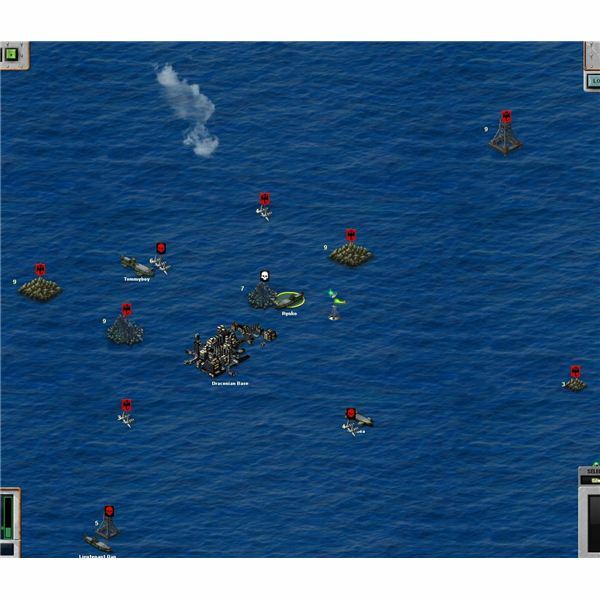 High level mines have massively powerful fleets and are extremely difficult to capture. Releasing the mine voluntarily causes these fleets not to be there. Thus, the nice thing to do is to release the mine whenever you're done using it, especially if it's a high level one. Even if you're planning to come right back to mine some more, releasing it in between ensures that the Draconians won't steal it in your absence. Finally, when first approaching a mine, send your fleet to a spot next to it rather than capture it directly. Sometimes someone else is heading for the same mine and gets there first. If your fleet is set to capture, it will attack their fleet. Last but not least, you can attack other players – any player base within five levels of you in either direction, any fleet regardless of level. How much you get from a base depends on how much your target had at the time of your attack and what buildings you destroy. 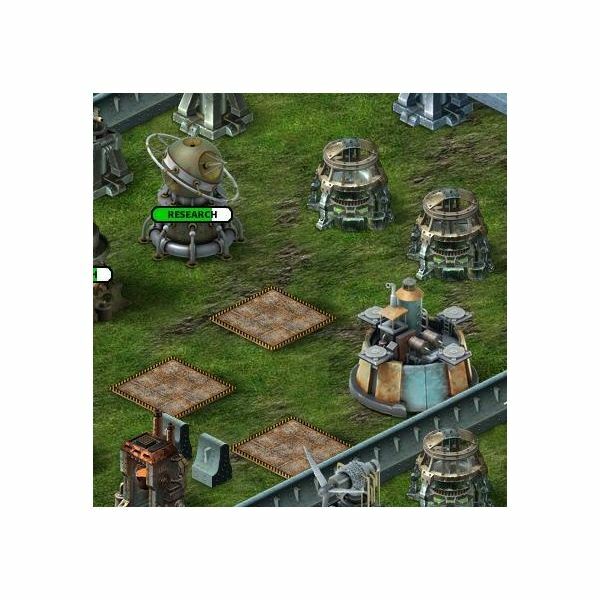 Resources are stored in the resource generators, the warehouses, and the outpost. You get a small percentage for warehouses (10% each at the time of this article) and a larger percentage (20%) for the outpost. If they were maxed out, you can get millions of each resource in a very short time – up to 500% of your fleet's cargo space. Likewise, how much you get from a player fleet depends on how much cargo they had at the time. You get up to 100% of whatever they had, up to the size of your own cargo space. A common bullying tactic is to attack a mining player that has just defeated a Draconian force, who is therefore both weakened and carrying the lump sum resource reward. Or watch them mine, then attack when they're nearly done. These tactics tend to happen a lot more near sector boundaries than mid-sector. Since most of your resources will come from your own actions on the map – whether salvaging, mining, or hitting other players – you have nearly full control of exactly how much you have on hand at any given time. The best way to avoid attacks from resource thieves (aka farmers) is to just not have anything to steal when you're not online. Keep it spent as fast as you take it in. Take advantage of damage protection bubbles as a good time to hoard, but spend it all before the bubble lifts. Good resource management won't deter attacks from everyone. There are many other reasons why people attack in Battle Pirates. You might've attacked them, or annoyed them at the mines, or your base is next to their enemy whom they couldn't defeat so they hit you instead. Or they were bored. Resource theft is far from the prime reason for many players, but it's certainly a satisfying reward – so do your best to keep it low. 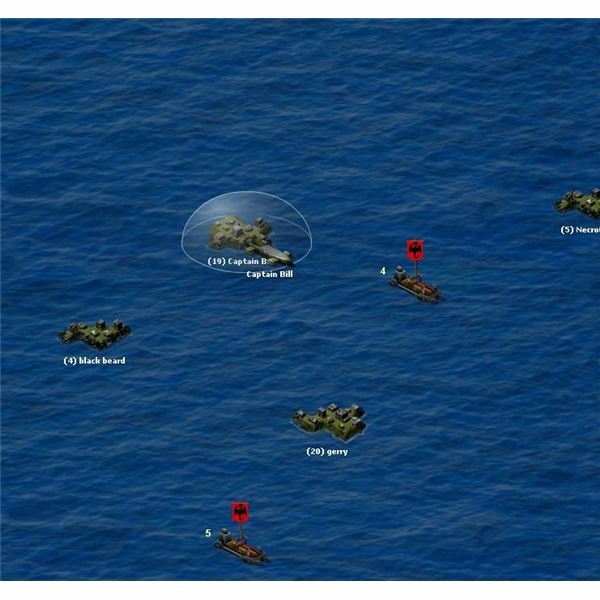 Learn the basics about defense (base layout strategies), offense (fleet strategies), resources, and how the map works in Battle Pirates, a Facebook MMORTS by Kixeye.